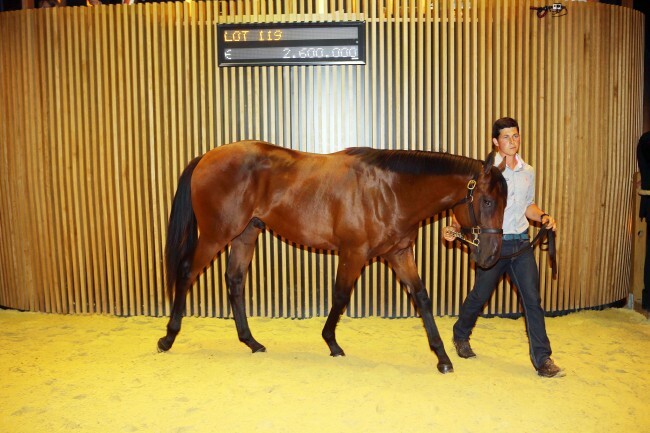 Deauville – 16/08/2015 – Arqana Vente de Yearlings d’Ao˚t – Lot 119 – N(PACIFIQUE 2014) M. 04/03/2014. Presente par Monceaux – Acheteur : FERGUSON John – Encheres : 2 600 000 Euros – Exciting records for the 2nd day of the ARQANA YEARLING AUCTIONS. EURO 20.515.000 for 85 horses. Sheikh Mohammed Al Maktoum is the top buyer, through his Agent John Ferguson, having acquired 8 horses on the sunday night for euro 5.590.000.& is the night’s leading investor ahead of of Bertrand Le Metayer.Bloodstock, who has signed 2 Buying orders for euro 1.680.000. Le Haras des Monceaux with 10 lots sold is top of the selling board for a turnover of a whopping euro 8.310.000.The sister of the Arc de Triomphe champion, TREVE, was unsold at euro 1.200.000. as the Reserve was not met. The owner Madame Christiane Head-Maarek said she was disappointed that the horse had not sold, she may train the horse for racing, or sell the horse privately. Yearlings issue of the Australian champion Redoutes Choice was probably a factor for a large number of buyers this year from Australia, Hong Kong & China. The Prince Aga Khan had a special arrangement whereby the Australian stallion came over to stand for 2 seasons at the Aga Khan’s studs, which it was estimated would bring new blood lines to the European race horses.